I'm certainly no physicist and I'm not qualified nor cranially equipped to speak intelligently about quantum physics and particle theory BS. In layman's terms, Antimatter is this mysterious negative-image of everyday matter that we can touch and see. However should the two ever meet, it's cataclysmic. 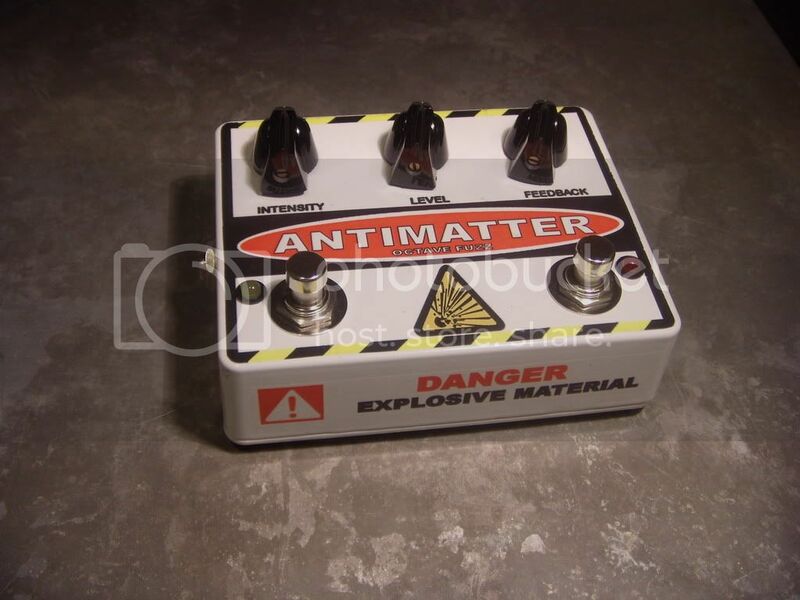 Everything goes boom and it's scary. It's also the world's most expensive material and it annhiliates everyting it comes in contact with. I like that last part about the annihilation. 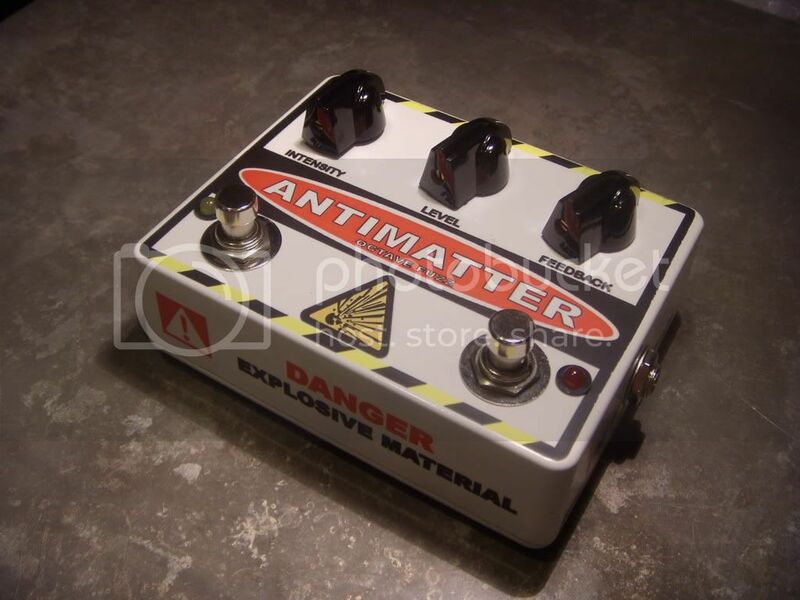 So...thus we have the Antimatter Octave Fuzz. Mysterious, dangerous, and when used improperly can cause such annihilation. 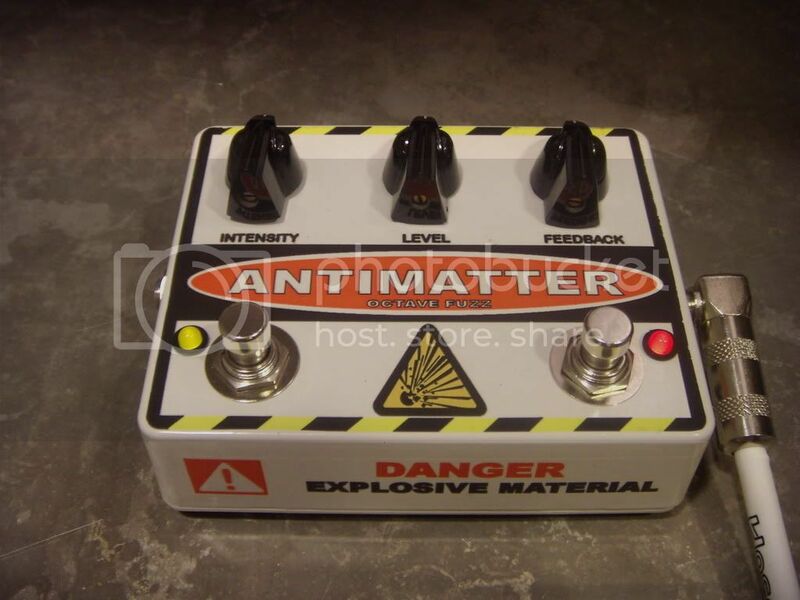 Ok, not really, but it is a damn cool fuzz pedal. 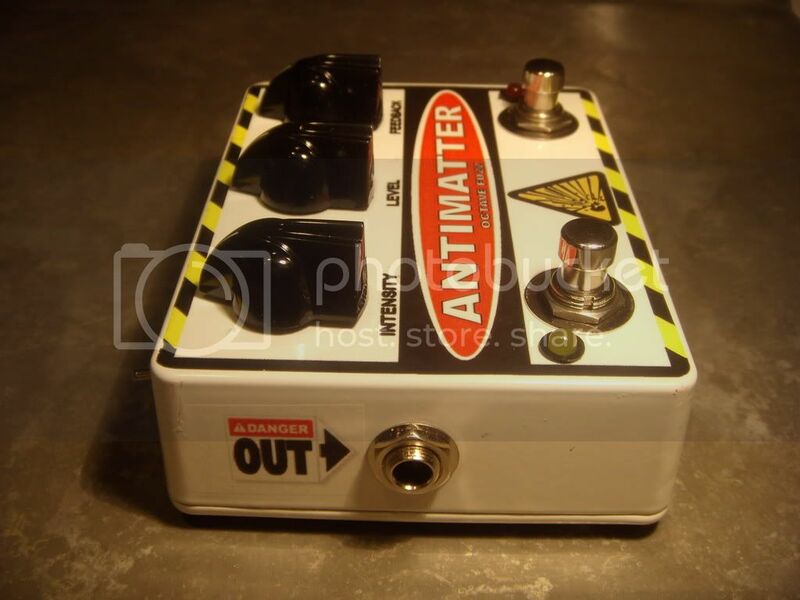 It's an Octavia clone with a footswitchable feedback loop and octave on/off switch. 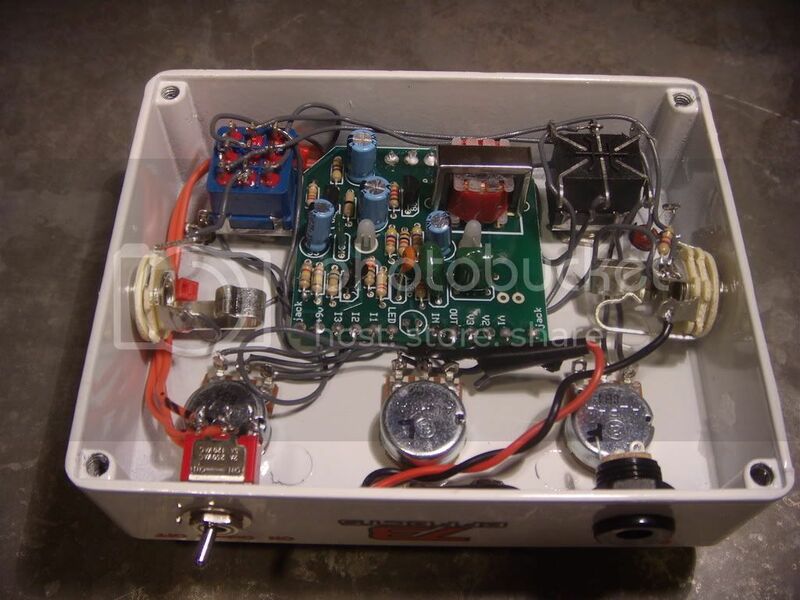 Basically it's a BYOC Octave Fuzz PCB in a 1590BB enclosure and some additional tweaks. The right-side switch and pot activate and control the feedback loop. Got the enclosure from Small Bear, powdercoated white. Not thrilled with the quality of the powdercoating, though. Full-face laser decal on the top. I still need to clear-coat it. Obviously I'm going for a "warning" sign look, with graphics inspired by the signs you might see around high voltage lines or nuke plants. Don't say I didn't warn you. The guts - the 9v jack isn't hooked up and there are still a few spots that need some heat-shrink, I'm going to do that after I clear-coat it. Post output, actually. I ran the "out" from the board through a DPDT switch, into a 500k Linear pot, back into the "in" on the board. Yeah I guess that makes sense! About to start building mine. 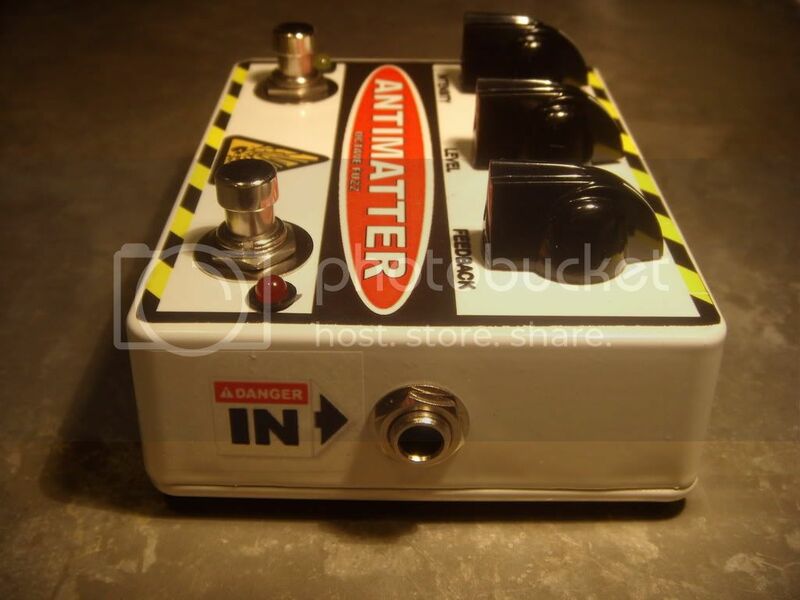 Thinking of adding a voltage sag pot - should make some interesting sounds. 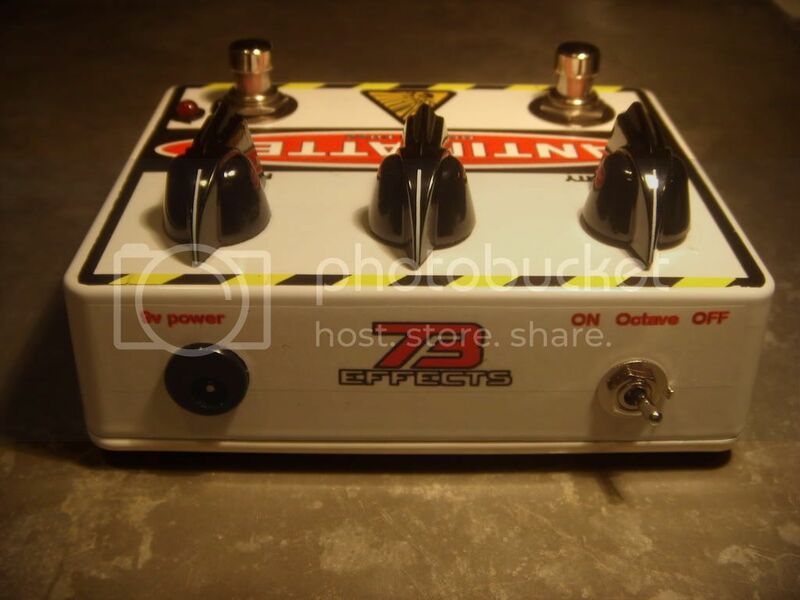 73 Effects creates hand-built and hand-finished effects pedals for guitar and bass.